During this trip you explore all different regions of Nepal. You visit the green, wild jungle of Chitwan in the south and Lumbini, the birthplace of Buddha, enjoy stunning mountain views from Dhampus and Pokhara and visit the most important places of Kathmandu and surroundings. After sightseeing in the beautiful old city Bhaktapur with its Durbar Square and numerous temples and pagodas you drive to Nagarkot. Nagarkot is one of the best hill side places for fantastic mountain views of Annapurna Range, Langtang Range and many more. Then you drive to Chitwan National Park, one of Asia’s richest and most spectacular wildlife sanctuaries and one of the best “Wildlife Safari destinations of the World”. This first National Park of Nepal covers an area of 932 km and is located in the subtropical inner Terai lowlands of south-central Nepal in the Chitwan District. Then the trip leads you to Lumbini, the birth place of Buddha with its numerous temples. From there you drive to the beautiful town Pokhara located at Phewa Lake. Pokhara is a small city which is an ideal place for Honeymooners, photographers, mountain lovers and any kind of travelers. 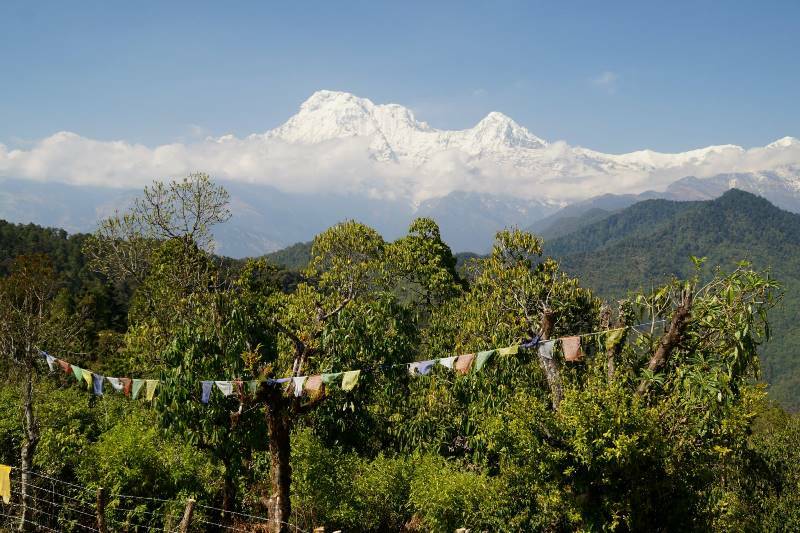 You can enjoy the natural beauty of its crystal clear lakes, the eye-catching mountain views of Annapurna, Manaslu, Dhaulagiri, fishtail and other panoramic mountains. In this tour you will visit the most beautiful places of Pokhara: From Sarangkot you can enjoy stunning mountain views of the Himalaya, you visit the World Peace Pagoda and go shopping at the lakeside before returning back to Kathmandu. From Pokhara you will reach Kathmandu easily by a 25 minutes scenic flight. You will complete your roundtrip by visiting the most important places in Kathmandu. Upon your arrival at Tribhuvan International Airport (TIA) in Kathmandu, a representative from our organisation will pick you up and transfer you to your hotel in Bhaktapur. In the evening you have a welcome dinner and your guide provides you a detailed briefing on your upcoming tour so that you are well prepared for the trip and any last-minute question is answered. After breakfast you explore the ancient kingdom Bhaktapur together with your guide. The gorgeous temples and artful woodcraft remind us of the past. In the morning you drive about 2 ½ hours to Namobuddha. On a ridge you can see the big monastery, one of the most important monasteries for buddhist pilgrims in Nepal. After exploring the monastery you drive further to Dhulikhel. If you want, you can drive only until Kavre and from there hike to Dhulikhel (duration about 2 hours). If the weather is good, you get great mountain views from there. In the afternoon you drive to Nagarkot, where you will stay overnight. The small town is located at a height of 2175m and is considered as the best Himalaya View Point near Kathmandu. In the evening you can enjoy a beautiful sunset over the Langtang-mountains. Today you wake up early to experience the sunrise. In the morning you can get the best views of the Himalaya. Then you drive about 1 hour back to Kathmandu, where you have time to rest. Later you will explore the old town of Kathmandu and visit Kathmandu Durbar Square with its numerous temples. The Kumari-, Bhairav- and Taleju temple with their pretty woodcraft are especially nice. Then you visit the "monkey temple" Swayambunath, an important place for buddhist pilgrims with a small stupa. After breakfast you drive to the Royal-Chitwan-Nationalpark. The ride takes about 6 hours. Until Muglin you drive along Trishuli river and then follow the Narayani river in a southward direction. After arrival you have time to freshen up before you explore the surroundings with your guide. If you have enough time you can do an elephant or jeep safari today. In the evening you visit the Tharu Culture dance house and enjoy the performance of local dances there. Today you have the whole day for exploring Chitwan. If you did not do the elephant or jeep safari the day before, you do it now. From the back of the elephants you have the chance to see four different kinds of deer, rhinoceros, bore, monkey, leopard, sloth bear and if you are really lucky you can espy the impressive Royal Bengal Tiger. After having lunch you have a canoe ride along the Rapti River. An excellent opportunity for bird watching and for looking at the 2 species of crocodiles here; the Marsh Mugger and the fish eating Gharial very close to you. After that you will have a short jungle walk which leads you to the Elephant Breeding Center. If you want, you can go to the river side later in the evening and enjoy the sunset there. After arrival at your hotel in Lumbini you have enough time to freshen up. Then you explore the birthplace of Buddha by foot. Lumbini is located near the border to India. The climate is warm and muggy and you hear many people speaking Hindi. A lot of people from India and Sri Lanka come here every week to pray at the birthplace of Buddha. The huge green area of Lumbini with its numerous temples donated by countries all over the world is too big to be explored in only one day. Today we continue sightseeing comfortable in a riksha. After breakfast you drive about 6 hours to Pokhara. If you have good weather you have good views of Manaslu, Lamjung and the Annapurna range even from the bus. Pokhara is located next to Phewa Lake and offers a great view of the Himalaya. After having lunch you have free time to go shopping at the lakeside with its numerous small shops, or you can make a boatstrip. In the morning you go to the other side of the lake by boat and hike about 200 meter up to World Peace Pagoda. The path leads through shady forest and offers great views of Phewa Lake and Pokhara down and the mountains in front of you. If you are not interested in hiking up to the stupa, you can make a boat trip to a small island with a temple. In the afternoon you visit Mahendra cave, which is not far away from Pokhara. You have to wake up early in the morning and drive to the view point Sarangkot by taxi. From there you get a fantastic view of the mountains and enjoy the sunrise. After breakfast you drive about 1 ½ hours to the small village Dhampus. If you like, you can only drive until Phedi and hike about 1 ½ hours from there to Dhampus. If you have good weather, you get an haunting panoramic view of Machhaputre, the striking mountain of Pokhara, and the Annapurna range. In Dhampus you can also experience, how the local people produce honey, cheese or herbage. Today you undertake an easy day hike: You wander through Dhital Gaon, uphill and downhill through beautiful forest and villages. In this region live the Gurung, an ethnic group which comes originally from Tibet. The last part of the way you will drive by car back to Pokhara. In the morning you fly with a small prop airliner about half an hour back to Kathmandu. The panoramic flight offers fantastic views of Langtang Ri, Ganesh Himal, Manaslu, Lamjung, the Annapurna range and green valleys below you. After arrival at your hotel and few time to rest, you visit Pashupatinath, a famous pilgrimage place for Hindus, located at Bagmati river. Every week come plenty of people from whole Nepal and India to pray there. At the shore of Bagmati the believers burn their dead relatives and pray and give donations to the gods in the temple. The Shiva temple is one of the most important of the indian subcontinent. If you like you can book an Everest Mountain Flight which you would do today in the morning. During the flight you can view Mt. Everest and the surrounding mountains next to you. After arriving safely at the Domestic Airport Kathmandu, you have free time to go to Thamel and buy some souvenirs. If you like you can visit the orphanage in Sundarijal. There are living 46 children, who would like to show you their home and give insights in their daily life. In the evening you have a farewell dinner together in Bodhnath. From the roof top of the hotel you can enjoy a good view of the biggest stupa worldwide while having dinner. Many Tibetan people come to Bodhnath, circle the stupa and mumble prayers. Enjoy your last evening and the unique atmosphere there. Depending on your flight time, you can buy some more souvenirs in the morning or just relax in your hotel. Then you will be transferred to the airport and fly back home. Activities : Sightseeing in Kathmandu, Pokhara, Chitwan, Lumbini, Dhampus, etc.